Like many family history researchers I have accumulated a jumble of notes, documents, family stories, copies of birth, marriage, death and census records plus family photos, some labelled, many not. Inevitably, there are many gaps but I wanted to put what I do have into some order and hope that the information may be of interest to other descendants of Neil Campbell and Betsy McKinnon who left the island of Mull in Scotland in 1857 and settled on a farm near Owen Sound, Ontario. I have used family history recollections compiled by my father in 1976, letters from Neil’s granddaughter Bess Kelso, research in Canadian and Scottish records, plus information and photos generously shared by other relatives, both near and distant. I have tried to be as accurate as possible and check as many sources as I could but I know that errors will have crept in so I would appreciate receiving corrections and additional information by anyone who reads this account. If anyone has other pictures of the eleven Campbell children and their parents I would very much appreciate receiving a copy which I could include here. When I started searching for ancestors in the Canadian census the Campbell family, in 1861, were the first ones I found. Neil Campbell as head of the household was listed first, followed by his wife Betsy, then the children in order of age. I felt that I could almost see them, standing outside their modest farm home, probably a log cabin, all in a row from tallest to smallest. I wanted to know more about them, how they had lived and where they went. I was also curious about the place they had left in Scotland. In 2006 I took a vacation trip to the United Kingdom with a group of fellow genealogists from the Edmonton Branch of the Alberta Genealogical Society. After our time researching in London many of us scattered to other parts of the country, looking for our ancestral places. I took the train north to Scotland and from Oban took the ferry to Mull. Not brave enough to rent a car and drive on Mull’s mainly single-lane roads but with wonderful help from the guide and owner of the hiking company “Mull Magic”, I was able to find Corkamull, the home where the Campbells were living at the time of the 1851 Scotland census. It is located very near the small ferry which takes people across to the island of Ulva. No one was home at Corkamull so no information from the current owners was available but it appeared to have become a holiday home, enlarging or completely replacing the home in which the Campbells lived. But, it is still in the location where they lived in the mid-nineteenth century and bears the old name. Island of Mull, October 2006. A view of the croft where the Campbell family lived in 1851, taken from the ferry travelling to Ulva. The Corkamull house, white, with two chimneys, is at centre left. The ferry dock is on the lower left. Pam Forsyth at the gate to Corkamull farm, October 2006. The name is in tiny letters on the second rail of the gate, near my elbow. In front of the Corkamull house, October 2006. This is probably a complete replacement of the house occupied by the Campbell family. No one was home so there was no opportunity to find out any details. The house occupied by the family in the 1850s was likely much smaller, perhaps with a thatched roof. Perhaps this one is even a descendant of those raised by the Campbells in the 1800s! The Ulva Ferry at the Mull side,and its Captain Donald Munro. As the photo shows,the distance to the dock on Ulva is very short. A story I read while on the island said that the great-great-grandfather of David Livingstone, 19th century explorer in Africa, was from Ulva. He fought in 1746 at the Battle of Culloden, for Bonnie Prince Charlie, and was one of the lucky ones who managed to escape afterwards, carrying with him one of the Prince’s flags or “Colours”. He made his way across Scotland and Mull and then swam the last few hundred yards to get home to Ulva, with the folded flag safely strapped to his back. October 2006. A typical Mull scene of beautiful landscape, sea, hills, mist and rain about to descend. I stayed at the Western Isles Hotel in Tobermory, the main town in Mull. This photo is looking down from the Hotel to the town’s main street. Neil Campbell (1808- 1892) and Betsy (Elizabeth) McKinnon (1824-1909) were married on 4 Feb, 1845 in the parish of Morven on Mull, Argyllshire, Scotland. They had six children, two boys and four girls, while living on Mull. The birth record of their daughter Marion/Sarah Campbell, born in April 1855, the last of the children to be born on Mull, states that Neil Campbell is age 45, occupation “Cottar” (someone who rents or leases a cottage in return for labour on the land), born on the estate of Glenforsa in the parish of Torosay, Mull. Glenforsa was an estate that belonged to Laclan MacQuarie one of the main landowners in Mull. Neil’s wife, Betsy McKinnon, was also born in Torosay parish. In the 1851 Scotland census Betsy is 25, Neil is 40 and he is the farmer of thirty acres, exclusive of 15 cattle pasturing, employing two labourers. One male farm servant, age 20, and a twelve year old girl, listed as a cow-herd, lived with the family at a farm or croft called Corkamull. Neil’s parents were Alexander Campbell (1760-1847) and Mary McArthur (1770-1847). Betsy’s parents were Angus MacKinnon and Flory Curry. In 1831 Mull had a population of about 10,800 but it steadily declined after that. In 1851 there were 8,369 persons on the island and by 1861 the population was down to 6,834. By 2011 it was about 2,800. The Campbells were probably forced to leave Mull by a combination of the Highland Clearances (which started on Mull in the mid 1840s) and the potato famine of 1846-1855. Neil’s brother, Archie Campbell (1796-1887), had previously moved to Canada, to Grey County in the area around Owen Sound (Keppel township), which is why Neil picked that location when they emigrated. With the help of information on the Mull Families website (mullfamilies.co.uk) I discovered that Neil’s sister Marion/Sarah Campbell (1812-1899) who had married Hugh McKinnon (abt 1799-1885) seems to have emigrated around the same time as Archie. Both Archie Campbell and Hugh & Sarah McKinnon and their families are in Grey County at the time of the 1851 census. In the 1861 census the Hugh McKinnon family is living right next door to the Neil and Betsy Campbell family. Another brother, John Campbell (1798-1883) also came to Canada and settled a short distance away in Bruce County (Saugeen township). A fourth brother Donald Campbell (1803-1873) also came to Grey County and is buried at the Greenwood Cemetery in Owen Sound next to Archibald and some of Archibald’s family. Gravestones in Greenwood Cemetery, Owen Sound. The larger one is for Archibald Campbell (1796-1887) aged 91 years. It also memorializes at least one other person, Euphemia Stewart Campbell but I don’t have a picture of that side of the stone. The smaller stone with the peaked top is for Donald Campbell who died 26 Jan 1873, aged 70 years. According to a distant cousin in Australia (found through DNA testing) whom I contacted by email, Colin Campbell (1789-1873), an uncle of the brothers Neil, Archibald, John, and Donald Campbell, moved from Mull to Australia in 1854 with his family. So in the space of about ten years many of our Campbell ancestors had been compelled to leave the island that had been their home for generations. Arrival in North America: In the “New York Passenger Lists 1820-1957”, on the Ancestry website, I found the arrival of the Neil Campbell family at the port of New York. On July 15, 1857, Neil Campbell, age 47, his wife Betty, age 31, and their six children, John (age 11), Mary (age 9), Christina (age 7), Ann (age 4), Sally (age 2), and Alexander (age 6), arrived aboard the ship Albert Gallatin. The ship’s last port before New York was Liverpool, England, where it was cleared to leave on June 10, 1857. There were 582 passengers on board (one of whom died en route to New York). It seems that there were about twenty crew members as well because the ship’s manifest, when it landed in New York, listed 602 persons aboard. The Campbells were “Lower Deck” passengers, the cheapest rate. Other more expensive choices included Upper Deck, 2nd Cabin, and Cabin. The Albert Gallatin was named after a prominent American politician (1761-1849). It seemed to specialize in carrying immigrants to North America. Most of those on the ship when the Campbells travelled were from Ireland and Scotland and intended to stay in the United States or Canada. According to information from Neil and Betty’s granddaughter, Bessie Kelso, the Campbell family were kept in quarantine in New York for six weeks. So, after thirty-five days at sea, and forty-two days in quarantine they were able to continue on their journey to Canada, arriving in Grey County shortly before the winter of 1857. After establishing themselves on a farm in Sarawak Township, Grey County, five more children were born to the family. After Neil and Betsy retired from the farm they lived in this house in Owen Sound. Photo courtesy of Sharon Baldwin. This wood engraving of the harbour at Owen Sound was published in a book or magazine in 1882. I bought it framed at a genealogy conference from a vendor who specialized in old maps and engravings. Exact information as to where it came from was not listed, just the date of publication. Since two or three of the Campbell sons were working on the Lake boats around this time I thought it gave an interesting look at the environment in which they worked. John, the eldest child, was born in Scotland, blessed on 24 July 1845 in the parish of Kilninian and Kilmore on Mull. He is living with his family on the farm in Ontario at the time of the 1861 and 1871 census. In 1881 he is age 36, unmarried and still living on the family farm with his parents and siblings. By the 1891 census he is no longer living with his parents who still have four unmarried children living at home and I could not find him elsewhere in the census. There are many John Campbells but once they are not living with a family group it is difficult to sort them out. According to my father’s account – the family story about John Campbell is that he went prospecting during the Klondike gold rush, joining about 100,000 men who flocked to the Yukon in the period 1896-1899. After he died, his partner came back to Owen Sound with quite a bit of money. His family were suspicious of the circumstances in which he died; his sister Ann was convinced he had been murdered. With this information in mind I checked the 1901 census and was interested to find a John Campbell, age 53, single, a miner, living on Texada Island, Burrard, British Columbia. His birth date is difficult to read but looks like June 18, 1848 which is three years off as it should be 1845, but I think it is probably him. Many people shaved a few years off their ages when speaking to the census taker. He gives 1858 as his year of immigration to Canada which is one year off, but not surprising as he was just a young child at the time they came to Canada. He has a lodger John McPhee, age 50, also a miner. John’s niece Bessie Kelso said that he died in British Columbia in 1907 and was buried there. In the British Columbia vital statistics records online I found a 57-year-old John Campbell, of Otter Cove, Vancouver Island, a prospector, born in Scotland, who died on May 31, 1907. No physician was in attendance. The coroner notes that an inquest was not necessary. As J.A. Clegg, undertaker, was the informant of the death on June 5, 1907, I am guessing that the body may not have been found til a few days after his death. Although this may have contributed to the family’s feeling that his death was suspicious, the death certificate states that he died of heart disease, which he had for about two months. Mary Campbell McInnis (1847-1918) from a family group photo, undated but probably taken in the mid-1890s. Mary was born at the croft of Corkamull, on the island of Mull. She was “Blessed” in the parish of Kilninian on 2 May 1847 so was probably born very shortly before that date. As a young girl she came with the family to Canada and is recorded there in the 1861 census. On 28 Feb 1867, at Owen Sound, at the age of nineteen, Mary married thirty-two year-old Gilbert McInnis (1834-1918), a farmer, who was also born in Scotland. The couple had twelve children: Mary (1868-1932); Archibald (1870-1953); Neil (1871-1897); Elizabeth (1874-1945); Gilbert (1876-1961); Sarah (1879-? ); Katie (1880-1907); Maggie (1882-? ); Flora Campbell (1884-1975); Martha (1886-1962); John Alexander (1889-died before 1975); Donald (1892-1895). Some of the children stayed in the local area while others went further afield. Elizabeth (Bessie) and her husband Gideon Carrie moved to Saskatchewan sometime before the birth of their second child in 1909 and farmed in Wolverine Municipality near Humboldt. Flora Campbell McInnis trained as a nurse and in 1917 joined the Canadian Army Medical Corps, serving in the Davisville Military Hospital and the Spadina Military Hospital in Toronto. John Alexander McInnis became a lawyer and practised at Sault Ste. Marie. Mary & Gilbert’s daughter, Katie (Katherine) McInnis (1880-1907). This is one of the unlabeled family photos that I inherited from my father. By comparing with another photo owned by Katie’s great-niece Sharon Baldwin I was able to identify her. So, it’s always worth keeping those old photos – sometimes you do figure out who they are! Her beautiful, elaborate hat must have been the height of fashion. Sadly, she died at age 27, of tuberculosis. This photo has moved from my “Mystery Photos” section into the McInnis family section since cousin Sharon Baldwin identified him as her great-uncle John Alexander McInnis (b. 1889), the second youngest of Mary Campbell & Gilbert McInnis’s twelve children. He was a lawyer who took his law degree in Kingston. That is probably why this photo was taken at the C.H. Boyes studio which operated in Kingston from 1902-1925, or later. When I saw that both Mary and Gilbert died in 1918 I thought perhaps they had succumbed to the flu pandemic that was sweeping across the world at that time but a check of the Ontario death records indicates that they both died of other causes. Mary died, age 71, on 24 Nov 1918, at Sydenham, Grey County. The cause of her death was listed as “degeneration of heart muscle”. Her address at the time of death was the family farm, Lot 5, Concession 5, Sydenham; the postal address was Bognor R.R. 1. Gilbert McInnis had pre-deceased her by a few months. He died on 7 July 1918, age 84, in Grey County. His cause of death was listed as “senile degeneration”. Below is a picture of Mary Campbell and Gilbert McInnis that I have copied from the Family Tree named “The McInnis Family Tree” posted to Ancestry.ca by “zenmar3335”. My thanks to Sharon Baldwin, owner of the picture, for making it available. Alexander, known as Sandy, was born on Mull in 1849 and came to Canada with the family when he was a young boy. He is with his family in the 1861 census and again in 1871, working on the family farm in Sydenham township. He died on April 7, 1875 at the age of 26 of “Dropsy (six months)”, according to Ontario death records. Dropsy was a term used at the time for generalized swelling or fluid retention. It may have been associated with heart disease or kidney or liver disease.The informant of his death was his father Neil. It seems that Sandy did not marry. His gravestone is in the Greenwood Cemetery, Owen Sound. I have no family stories about this young man but he must have been much loved by his sister Sarah as she named her first and only son after him – Alexander Campbell Plaunt, born in Minnesota in 1888. My only photo of Christie Campbell is this one which is part of a family group picture, probably taken in the mid-1890s. Christian or Christie Campbell was born on Mull in the Kilninian & Kilmore parish in March 1851 and came to Canada with the family as a child. She is living on the family farm in the 1861 and 1871 census. On August 13, 1872, in Grey County, at age 21, she married Alexander McDonald (b.1851-died after 1910 census) also age 21, born in Scotland. In the 1881 census the McDonald family is farming in Grey South, Bentinck subdistrict and have four children, Margaret 8, Ronald 6, Alexander 4, and Elizabeth 2. Three more children were born in Ontario – John A., Neil, and Flora – but by 1891 the family had decided to move to the United States. In the Minnesota census taken June 29, 1895 the McDonald family are living in Duluth’s Ward 1. Alexander McDonald, age 44 works as a policeman. He has been resident in Minnesota for four years, three years in this enumeration district. Others in the household are his wife Christie 42, and their children Ronald 20, Alexander 18, Elizabeth 15, John A 14, Neil 11, Flora 7, and Sarah 3. All the children were born in Canada except Sarah who was born in Minnesota. In the 1900 United States federal census for Duluth, Minnesota it notes that the family immigrated to the U.S. in 1891. At that time the family has had eight children, of which seven are living. The one who is dead must be Margaret or Ronald as all the others are recorded as living with the family. In the June 1905 Minnesota census Christine McDonald, age 53 is living at #807 East 2nd Street, Duluth. With her are son Alexander, age 27, son Neal, age 21, and daughter Sadie, age 13. This census does not record marital status so it does not indicate that Christie is a widow. Alexander could be dead or might just be away from home for some reason. This is the last record that I have found where I am sure that I have located our Christie. Other possibilities: By the 1910 census, a search for Alexander and Christie McDonald does not find anyone in Minnesota but does reveal a couple living in Burbank, California who are the right ages and who have been married for 37 years, also fitting with our people. But, as none of their children are living with them it is difficult to determine if these are the the right people or another McDonald couple who coincidently match them by name, age and years married. In another part of the 1910 census I did find two of Christie’s children in Duluth, Minnesota living with their widowed uncle, Joseph Plaunt and three of his children. Neil McDonald, nephew, single, age 26, is working as a driver for a laundry company, while Flora McDonald, niece, single, age 24, is working as a stenographer for a Glass Company. By the 1920 census I could not find Christie or her husband. One or both may have died by that time but McDonald is a very common name and I may just have missed them. In California death records I noticed an Alexander McDonald, age 59, born about 1852 who died Jan 16, 1911 in Los Angeles county (where Burbank is located). There is also a death record for Mrs Alex McDonald, age 75, born about 1851 who died April 21, 1926 in Los Angeles county. These may be our people but I cannot be sure as only the index to the death records was available to me and it does not give enough detail. It would be necessary to see the complete record to confirm or not whether these are from our family. Ann was born on Mull in May 1853 and came to Canada with her family as a four-year-old child. She is with the family on their farm in the 1861, 1871 and 1881 censuses. On May 23, 1884 in Sarawak township, Grey County she married a recent emigrant from Dornoch, Sutherlandshire, Scotland, Alexander Forsyth (1850-1937). They probably met while he was working on the construction of the Bruce and Grey Railroad. With this first-hand experience of the amount of rock and bush covering potential farm land in Ontario, he thought that farming prospects were better in Manitoba with its open prairie than in Grey or Bruce counties in Ontario. The couple moved to southern Manitoba where Alexander and his brother Donald Forsyth (1846-1914) had recently established homestead claims. The couple had three sons – William Forsyth (1885-1939), Neil Campbell Forsyth (1889-1966) and Alexander Forsyth (1892-1918). Later they adopted another son Wilfred Forsyth (1904-1977), son of Ann’s niece Lulu Mouck (1885-1954). Lulu was the eldest daughter of Ann’s younger sister Flora Campbell and her husband Chester Mouck. The Forsyth Family in about 1898-1900. Standing: L. to R.- William Forsyth (1885-1939), Neil Forsyth (1889-1966). Seated: L.to R. – Alexander Forsyth (1850-1937), Alexander Forsyth (1892-1918), Ann (m.s. Campbell) Forsyth (1853-1941). Thanks to Betty Sumner and Budd Forsyth for this photo. Ann and Alex Forsyth farmed in the Boss Hill district, near Woodnorth until 1920 when they retired from farming and moved to the nearby village of Virden. Alexander died in 1937 and Ann in 1941. Their son Neil continued to farm on the original homestead until his death in 1966. The Forsyth farm home at Boss Hill, Manitoba on the day of Neil Forsyth’s wedding in July 1920. Herb MacAlonen, brother of the bride-to-be, had come with his car to pick up the bridegroom and his family and drive them to Hargrave where the wedding was to take place. Left to right: Herbert MacAlonen, Mrs Alex Forsyth [Annie Campbell] (1853-1941), Mrs William Forsyth [Annie Sutton] (1890-1982) , Neil Forsyth (1889-1966), Wilfred Forsyth (1904-1977), Mrs Flora [Campbell, Mouck] Hamilton (1863-1935), Alexander Forsyth (1850-1937). William Forsyth (1885-1939) in his army uniform in World War I.
William (Bill or Willie) Forsyth, born in Manitoba in 1885, worked on the family farm as a young man but later went to work for the Canadian Pacific Railway as a fireman. He served as an alderman on Brandon City Council in the late 1930s. In 1920 he married Annie Sutton (1890-1982) of Brandon. They had one daughter. Alexander Forsyth (1892-1918) in his World War One army uniform. Alex was born on the farm in Manitoba in 1892. He lived and worked there until he enlisted in the Canadian army in December 1914. He was killed in action in France in October 1918. Neil Campbell Forsyth (1889-1966) had also wanted to join the Army when the War started but in the end, he was the son who stayed home to help his elderly parents run the farm. In 1920 he married Elizabeth McAlonen (1891-1959) of Hargrave, Manitoba. Neil operated the family farm until his death in 1966. He and Lizzie had four children. Wilfred Forsyth (1904-1977) in his World War II army uniform – 1940. He was in the Canadian Army’s Lake Superior Regiment and served in England, France, Holland, and Germany. Wilfred married Sarah Short Cameron (1910-1992) of Woodnorth, Manitoba in 1940. After the War they bought and operated the general store in Woodnorth. For many years they also operated the village post office. They had two children. In Mull and other Gaelic speaking parts of Scotland the names Marion and Sarah are interchangeable. When her birth was recorded in 1855, the first year of civil registration in Scotland, she is recorded as Marion Campbell, born April 22 at Corkamull in the parish of Kilninian and Kilmore. In subsequent census records in Canada and the United States she is known as Sarah. She was the last child in the family to be born in Scotland. She is with the family in Grey County for the 1861, 1871, and 1881 censuses. Sometime in the 1880s Sarah married Joseph Plaunt who was probably born in Quebec as his mother tongue is listed as French on at least one census record. I searched for their marriage in Ontario, Quebec, and Minnesota records without success. According to information that Joseph gave in the 1910 census, they immigrated to the United States in 1885. -Alexander Campbell Plaunt (Oct 11, 1888 – Jan 25, 1948). He worked as a plumber and plumbing contractor. In a 1957 Trade Directory for Duluth there is a listing for a plumbing and heating company, Plaunt Co. where both his son James Plaunt and his daughter Lois Plaunt work. Joseph Plaunt was issued a Minnesota homestead document on Oct 3, 1888 for 160 acres but it seems that they did not farm, or not for long, as Joseph and Sarah Plaunt and three young children are living in Duluth at the time of the June 1895 Minnesota census. It seems likely that Sarah died sometime between the birth of her fourth child May Plaunt on Nov 9, 1895 and the 1900 Federal U.S. Census. I could not find Joseph Plaunt in the 1900 census but the four Plaunt children are living in a Children’s Home in Duluth. By the 1910 U.S. Federal census for Duluth, Joseph Plaunt, aged 48, a labourer in road work, is listed as a widower, a naturalized citizen who immigrated in 1885. By this time he has been able to bring his family back together. He lives in a rented house at 322 East 8th Street with three children, Alex age 22, Bessie age 18, and May, age 14. Hattie Plaunt, now age 20, is not living at home but, also living with the family are Joseph’s niece Flora McDonald age 24, and nephew Neil McDonald age 26. By the 1920 census, taken on January 8th, Joseph Plaunt, age 73 (25 years older than in the 1910 census! ), a widower, (mother tongue French) is living with his daughter Bessie, her husband Julius Brahms, a riveter in the shipyards, and their daughter Marjorie, age six. The youngest Plaunt child, May Plaunt, age 24, a stenographer working in an office, is also living in this household on East 6th Street in Duluth. There is a death record in Saint Louis County (where Duluth is located), Minnesota for Joseph Plaunt on April 4, 1920. I am presuming it is our Joseph but I saw the index only, not the complete record. Note: The Plaunt name is spelled in various ways in the census and other indexes- Plaunt, Plannt, Planut, Plante, Plant, etc. I have probably missed some records because I missed checking some variation. This photo was originally one of my “Mystery Photos” but I have come to believe that it probably is Sarah (m.s. Campbell) Plaunt (1855-189?). It was taken at the Gaylord studio in Duluth, Minnesota which operated at 93 East Superior in Duluth from 1882-1883, then at the German-American Block in Duluth from 1885-1887. Sarah & her husband were in or near Duluth from 1885 on. Although her sister Christie (m.s. Campbell) McDonald also lived at Duluth she did not arrive there until 1891 which is past the date at which the Gaylord studio operated. Also, this woman does not seem to look like the picture of Christie in the group photo which is included further down this page. In the 1861 census for Canada West (Ontario) Angus, age 2 at next birthday, is with the family, their first child born in Canada. He is also with the family in 1871 and 1881. In the 1891 census he is age 30, single, working as a labourer, and living with his parents, and brothers Hugh and Dan, and sister Katharine in the Owen Sound River Ward. By the 1901 census he is no longer with the family in Owen Sound. His niece Bess Kelso says that Angus also went to stay with one of his sisters in Minnesota and died there. I have not been able to determine when. In the various Minnesota census records that I have looked at he is not with either family but he may only have been with them for a short time. Hugh, born shortly after the family arrived in Canada, is with his parents in the census in 1861, 1871, 1881, 1891. In 1901 he is living in Owen Sound with his widowed mother, brother Dan, and Barbara Gunn age 24, domestic servant. On April 2, 1902 he married Barbara Gunn (1875-1951). The couple had four children Neil (1902-1982), William (Bill) Angus (1905-1984), Ann Elizabeth (born 4 Jan 1909, died the next day), Christina (1910- died before 1984). Hugh died in 1948 and Barbara in 1951. Their son Bill continued to live on the old farm and never married. At the time of Bill’s death in 1984 his obituary noted that he was survived by a nephew in Agincourt and a niece in Owen Sound. Flora Campbell was born on January 5, 1863 at Presqu’Isle, Sarawak Township, Grey County, where the family originally settled upon arriving in Ontario. She was living with her family on the farm in the 1871 and 1881 censuses. On January 28, 1885 she married Chester Mouck (1860-1893), literally “the boy next door”. His parents William and Jane (m.s. Williams) Mouck and their ten children lived on the farm next to the Campbells. They had moved north to Grey County from their native Prince Edward County shortly after Chester’s birth in 1860. Flora Campbell (1863-1935). There is no date on this picture but it may be an engagement photo. She has a ring on the third finger of her left hand and is holding a card which could be a photo of her fiancee Chester Mouck (1860-1893). Information printed on the back of the photo indicates that it was taken at the “Toronto Photograph Co., registered, 332 Yonge Street, Toronto, facing Gould, established 1870. W. Masters & Co.Proprietors”. The book “The Ontario Photographers List 1851-1900” indicates that a studio with that name may have been in business for only the year 1879. If that is the case she would be just sixteen in this photo. However, the company “Masters, William, & Co.” was in business from 1877-1886. This is probably the same photographer so he may have continued to use photo card stock with the address printed on it even if there was a small name change for the business. Flora and Chester had four children – Lulu Mildred (Dec 14, 1885- Nov 11, 1954), William Toulbert (April 5, 1887- Nov 2, 1894), Elizabeth Pearl (Jan 1, 1889- Oct 21, 1961), Florence Hazel (May 29, 1891-April 9, 1948). Chester Mouck died at the age of 33, on July 2, 1893, of peritonitis. Peritonitis is usually the result of a bacterial or fungal infection or may be caused by a ruptured appendix. Flora was left to raise four children under the age of eight. About eighteen months after his father died, seven-year-old William also died of peritonitis. Flora Campbell (1863-1935), Undated photo taken by E. Tucker Photographer, 29 Poulett Street, Owen Sound, Ont which operated from 1892-1920. Flora Campbell /Mouck /Hamilton (1863-1935) and her three daughters, left to right. Pearl Mouck (1889-1961) [married name Caldwell]; Florence Mouck (1891-1948) married name Goulding]; and Lulu Mouck (1885-1954) [married name Campbell]. Thanks to my cousin Diane Scott, granddaughter of Pearl Mouck, for this photo. Flora Campbell Mouck (1863-1935) and her second husband William John Hamilton (1860-1913). They married on April 29, 1908 at Sudbury. This is probably their wedding photo. Taken at the Chas. Copeland studio in Thessalon, Ont. which operated 1906-1925 or later. Having gone through many difficulties in raising her children after her first husband died so young, Flora married for a second time in 1908, age 45, to a widower, William John Hamilton. He was a veterinarian. They lived at Thessalon near Sault Ste. Marie. Just a little more than five years later, in July 1913, William died at the age of 52, of apoplexy and myocarditis. Flora often visited in the West where her sister Ann Forsyth lived as well as her daughter Pearl and other relatives. Pearl Mouck (1889-1961) married Gordon Caldwell (1888-1960) in 1916; they had three children and lived at Brandon, Manitoba. Florence Mouck (1891-1948) married James Goulding (1893-1967) in 1919 and had two children. They lived for a time in South Africa and in Orillia and then Toronto. Lulu Mouck (1885-1954) married John Campbell (1880-?) in 1916 and lived in Toronto and Montreal. They had no children. Flora Hamilton died in Orillia in October 1935 at age 72. She is buried at the Greenwood cemetery in Owen Sound with her first husband Chester Mouck, their son William, and daughters Lulu and Florence. Donald Campbell, always known as Dan, was born in March 1866. Although he worked on the family farm as a young man he decided to become a sailor and worked on the boats that sailed out of Owen Sound, moving goods and passengers to various ports on the Great Lakes. He did get his Captain’s papers and seems to have been known in the family as Captain Dan but his niece Bess Kelso told me that he preferred to act as a First Mate rather than a Captain. Unfortunately, he was another of the Campbell children to die young, at the age of forty. His death certificate states that he died of Bright’s disease of the kidney. He never married and between voyages he lived with his parents then with his widowed mother and brother at their house in Owen Sound. I believe he was a favourite with his nieces and nephews. Sharon Baldwin, granddaughter of Dan’s niece Bessie McInnis, provided me with a photo of an oak table that he gave to Bessie as a wedding present. Bessie stayed in Owen Sound with her grandparents and uncle Dan while she was going to High School. “Uncle Dan’s table”, a wedding gift to his niece Bessie McInnis. Donald (Dan) Campbell (1866-1906) No doubt he is wearing the Campbell tartan for some special occasion. He must have sent copies of this photo to all his sisters as it is owned by descendants of at least three of them. Dan Campbell (1866-1906) on the right in more conventional attire. The identity of the man on the left is unconfirmed but it could be Dan’s older brother Angus Campbell, who suffered from tuberculosis. This man does look frail and somewhat ill compared to Dan who has a protective arm around him in this photo. Perhaps it was taken just before Angus departed for the West in a vain search for a healthier climate. Thanks to Sharon Baldwin for this photo. Katherine Campbell Kelso (1867-1949) from an undated group photo, probably mid to late 1890s. Katherine Elizabeth Campbell, known as Katie, the last child in the family, was born May 8, 1867, just weeks before the birth of the Dominion of Canada on July 1, 1867. Until age 24, she lived at home with her family. On April 18, 1892 she married Henry Kelso (1865-1934), a teacher and later a school principal in Owen Sound. She and Henry had four children: Donald Campbell Kelso (1894-1968), Henry (Harry) Kelso (1897-1968), Elizabeth (Bessie) Kelso (1900-19?? ), and Alvira Jane (Jean) Kelso (1903-1995). Henry drowned at the age of 68, on June 24, 1924, in an accident when his boat capsized. Katie died at age 82 on Aug 5, 1949. Both are buried in the Greenwood Cemetery in Owen Sound. Donald Campbell Kelso (1894-1968) married Effie Irma Ney in Fort William in December 1918. They had three children. Henry (Harry) Kelso (1897-1968) married Mary Kathleen Allin in 1923 in Oshawa. Jean Kelso (1903-1995) worked as a stenographer. She married James Keenan on Feb 23, 1935 in Toronto. He was a businessman in Owen Sound where his family’s firm, Keenan Wooden Ware, later Keenan Industries, produced wooden goods of all sorts. (I still have an old box of the toothpicks which were one of Keenan’s most popular products.) They had one daughter. Bessie Kelso (1900-19??) was a teacher, first in some smaller communities, and then in Toronto. She married Robert Johnston, a widower. They had no children. Bess maintained contact with her Forsyth cousins in Manitoba and, in letters, provided some of the information about the Campbells that has been used in this account. 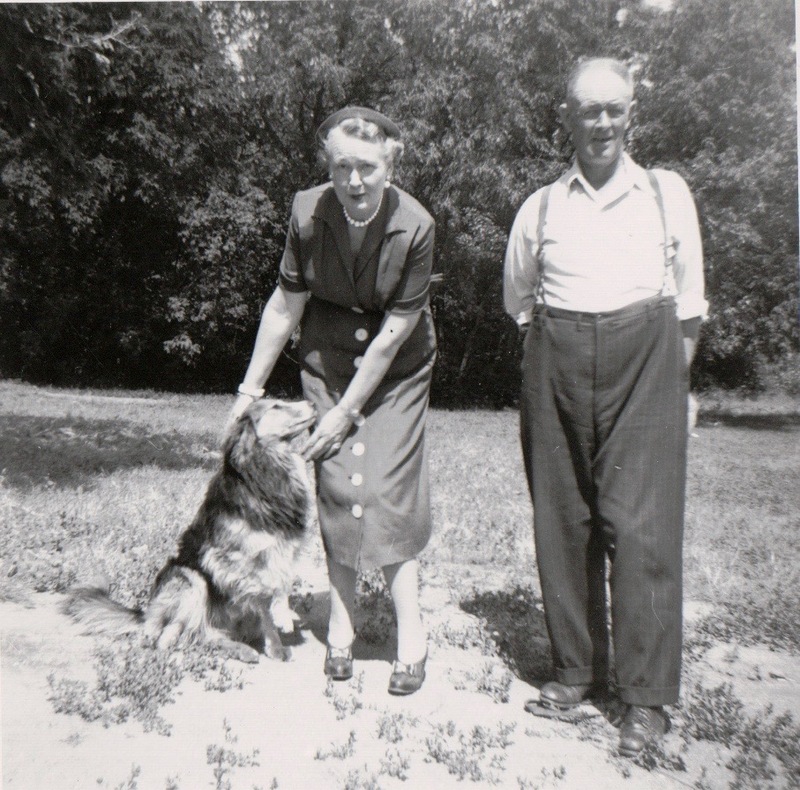 Bessie Kelso in about 1950 while visiting in Manitoba, with her cousin Neil Forsyth (1989-1966). Thanks to Betty Sumner for this photo. An undated photo of Betsy [McKinnon] Campbell (1824-1909) and four of her six daughters. Back row: on the left, Mary [Campbell] McInnis, (1847-1918) and on the right, Flora [Campbell] Mouck/Hamilton (1863-1935). Front row Katharine [Campbell] Kelso (1867-1949), Betsy [McKinnon] Campbell, Christie [Campbell] McDonald (1851-19??). Probably taken in the mid to late 1890s or early 1900s. Katharine is wearing a wedding ring so it would be after April 18, 1892 as that was when she married. My thanks to Sharon Baldwin for identifying “who was who” among the sisters. Gravestone in the Greenwood Cemetery for Neil Campbell (1808-1892) and his wife Bessie McKinnon (1824-1909) and two of their sons, Donald Campbell (1866-1906) and Alexander Campbell (1849-1875). This stone says that Donald/Dan died in 1907 but the Ontario death record states that he died Dec 3, 1906. In the 1970s my father Wilfred Forsyth was driving by the then-unoccupied Forsyth farmhouse at Boss Hill, Manitoba and noticed that a car was up by the house. He drove in and found my cousin Minnie (m.s. Forsyth) Harding (1921-2015) examining the damage done by burglers who had broken into the house. The thieves had taken a trunk which contained many old family photographs, dumping them on the floor before taking off with their loot (which also included the main staircase to the second floor with its beautiful wooden railing). Minnie offered a bunch of those photos to Dad and I inherited them. Some that I have used above were labelled but many were not. Below I have included some that I think to be members of the Campbell family, their children or grandchildren. Many were taken at Owen Sound, Ontario. If anyone knows who they are please contact me via the contact address for this website. I would love to be able to put names to these people. The information regarding the photo studios which operated in Ontario comes from two books by Glen C. Phillips, (1) The Ontario Photographers List 1851-1900, Volume One. (2) The Ontario Photographers List 1901-1925, Volume Two. Both were published in 2002 by Global Heritage Press/Global Genealogy.com Inc in Milton, Ontario. On the back of this picture it says “Mrs Henry Kelso Brookholm, Ontario, Brookholm P.O., Ontario.” I don’t think it can be the Kelso family as they had only four children, not five. Perhaps it was sent to Mrs Kelso who passed it on to her sister in Manitoba. I am trying to find out the town where Forster Bros. Photographers operated. So far they do not seem to be in the Ontario lists for 1851-1925 so could be in the United States. This photo was taken at the George Holmes studio at 116 Poulett Street Owen Sound. The style of hat was popular in the 1890s. According to the Grey Roots Museum and Archives website, George Holmes established his studio at 116 Poulett Street in 1886 or 1888. Poulett street became 2nd Avenue East in 1909 so the picture must have been taken within the time frame 1886-1909. The style of hat is similar to that worn by Katie McInnis (1880-1907), a daughter of Mary Campbell and Gilbert McInnis, pictured earlier. Another photo taken at the George Holmes studio at 114 Poulett Street – operated 1886-1909. Photo taken by George Holmes. It does not have the studio address like other pictures so may have been taken earlier before he operated out of the studio on Poulett St. So the date of this picture might be 1879-1888. It could be Angus Campbell (b. 1858/9- died aft 1891) on the left, and another of the brothers, perhaps Hugh Campbell (1861-1948). It is less likely to be Alexander Campbell (1851-1875) as he was dead before George Holmes started in the photography business. On back it says “From Archie to John”. But, which Archie? It could have been either of two Archibald Campbells, one born 1840 and the other b.1845 d.1894, or an Archibald McKinnon (b.1852), all cousins of John Campbell It was taken at the G.A. Hemstreet studio in Milton, Ontario which operated from 1877-1887. This picture was in the form of a post card. Taken at the James Studio in Owen Sound which operated from 1906-1925 and possibly later. The woman in the centre looks rather like Mary (Campbell) McInnis (1847-1918). Could it be her and two of her sisters in middle age? perhaps Christie and Katherine? On the back tamped “S.J. Dixon, Photo”. His studio operated in Toronto 1876-1896. Taken at the Edward Tucker photo studio at 29 Poulett Street, Owen Sound. It operated from 1892-1920. Taken at the Craig Studio in Owen Sound which operated 1881-1925 and possibly longer. No info on this one. The clothing looks like the 1860s or 1870s. I wonder if it could it be Alexander Campbell (1849-1875)? No info at all on this one. I love her elaborate hair bow and eyelet lace dress. Bows like these are in some other photos I have seen in the 1915 to 1920 period.